After a long wait, spring is finally here again in Baltimore. With the return of warm weather, Baltimoreans are returning to their favorite outdoor spots across the city. So where are they going? We have done a little Baltimore research to find out! The Washington Monument in historic Mt. Vernon. You do not need a focusgroup to realize that the Inner Harbor is an ideal spot to capture the magic of Charm City. This much photographed location is the definitive postcard picture of Baltimore. Visitors can enjoy the numerous attractions, but taking in the sights on a stroll around the famed harbor waterfront and up to Federal Hill Park won’t cost you a thing. When U.S. forces held the fort to defend Baltimore from the British navy in the War of 1812, Francis Scott Key was inspired to write the Star Spangled Banner, and a place was made in American history for Fort McHenry. Today, Baltimoreans enjoy the free 43-acre national park at the tip of Locust Point for recreation and relaxation. While every Baltimorean knows the history of Fort McHenry, far fewer are aware that Patterson Park also played a key role in the Baltimore of Baltimore. While the British Navy bombarded the fort, land forces advanced on Baltimore along what is now Philadelphia Road. American troops held the high ground at Patterson Park, forcing the British to retreat. Today, residents of East Baltimore love the 137-acre Patterson Park for its iconic Pagoda, built in 1891. Located just west of Hampden and north of Reservoir Hill, the 745-acre Druid Hill Park is one of the oldest landscaped public parks in the country, inaugurated in 1860. Visitors can enjoy Druid Lake, the Baltimore Conservatory botanical garden, the Maryland Zoo, and some of the oldest forest growth in Maryland. 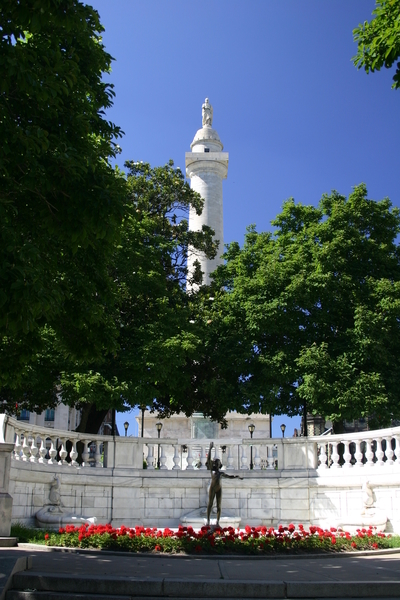 Visitors to Baltimore’s Washington Monument can experience Baltimore as it once was. Walk around Mt.Vernon Place to take in one of Baltimore’s most historic neighborhoods, as well as The Walters Art Museum and the Peabody Library, both free. This entry was posted on Wednesday, April 15th, 2015 at 6:01 pm. Both comments and pings are currently closed.